The OGH Public Bar offers that genuine Pub feel with a long wooden bar, pool table and doors that swing open to a beer garden. Afternoon summer breezes take the heat off long hot days and a roaring open fireplace heats up the cold winter days. 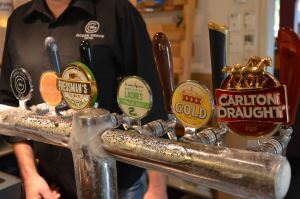 The Draught Beer pours icy cold and is complemented by a range of beers, wines and spirits that will help make your time with us a fun experience! We serve a great range of classic bar meals including our legendary Parmi, steak, fish and chips, burger and pizza! Make yourself at home at Public Bar in the only pub in town!